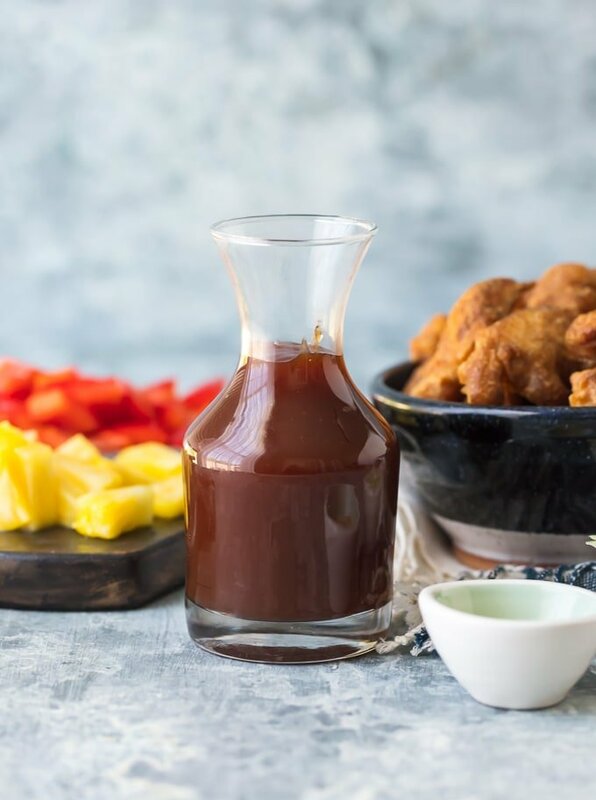 This Sweet and Sour Sauce recipe goes along with one of my favorite Chinese-American dishes: sweet and sour chicken! This homemade sweet and sour sauce is so tangy and tasty. I love slathering this sauce all over chicken, pork, or rice and vegetables. You can’t go wrong! 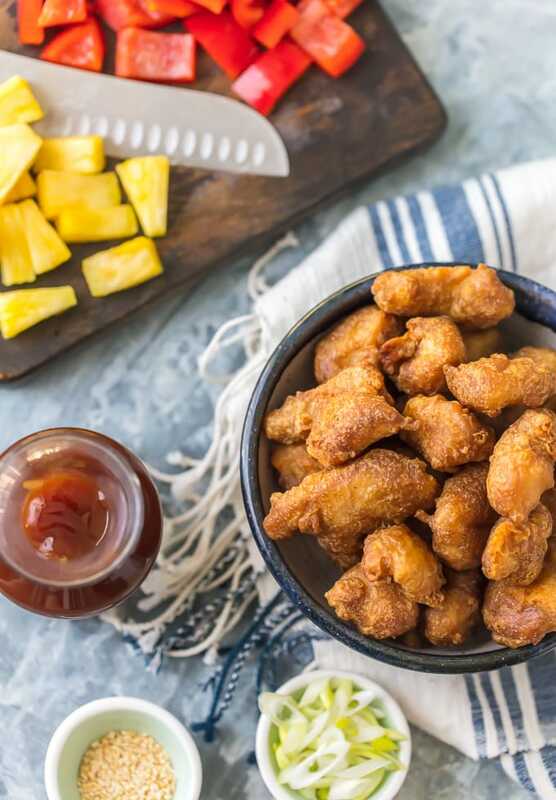 Sweet and Sour Sauce is an important component to sweet and sour chicken, and this homemade version is the perfect mix of flavors! 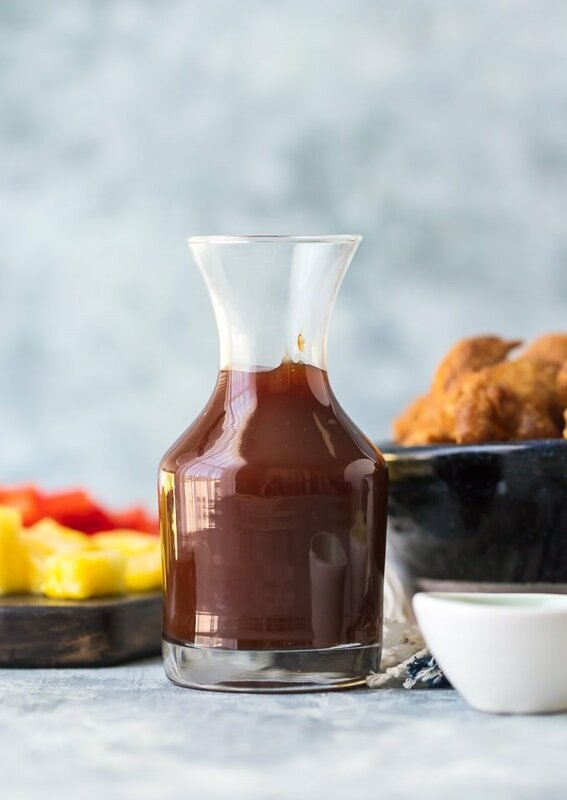 This Homemade Sweet and Sour Sauce recipe is filled with awesome ingredients that create the perfect balance of sweet and sour. This sweet and sour chicken sauce tastes SO good on crispy chicken or mixed with white rice and veggies. I’m glad I learned how to make sweet and sour sauce at home. It’s surprisingly easy to prepare and it will only take about 15 minutes. It’s ready in no time to go along with the chicken, so you can have homemade Chinese instead of having to order takeout. Pour it over chicken mixed with white rice, bell peppers, and fresh pineapple chunks. YUM! It’s the perfect meal. 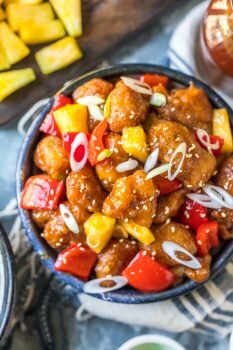 This easy sweet and sour sauce recipe is a must make! Make your own homemade Sweet and Sour Sauce to go along with your Sweet and Sour Chicken‎. 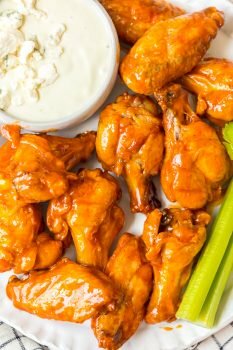 It’s easy, tangy, and delicious! Along with my homemade sweet and sour chicken recipe, I made this homemade sweet and sour sauce recipe. It’s the perfect mix of flavors and it tastes so amazing poured over the chicken. This sauce would work with just rice and vegetables too, or if you prefer pork, why not try sweet and sour pork with this sauce? This mix of ingredients creates the best sweet and sour chicken sauce. Sweet, sour, tangy…I guess that’s why they call it sweet and sour! 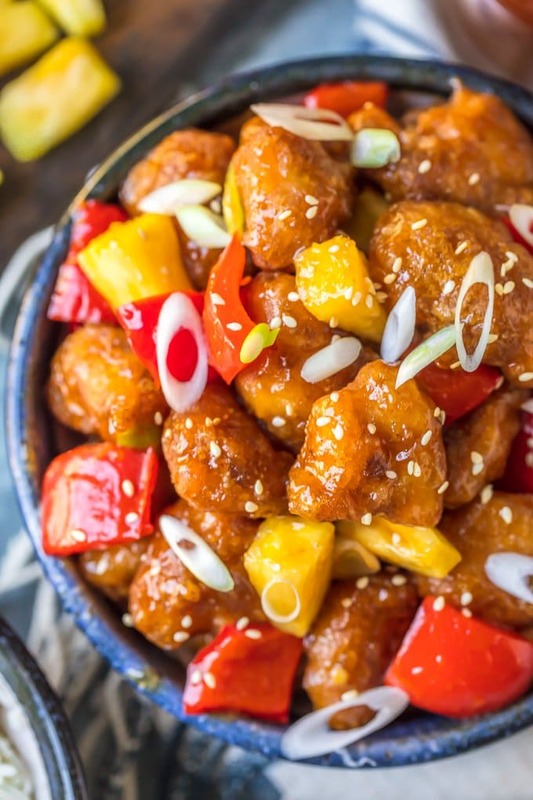 Once you learn how to make sweet and sour sauce, you’ll be making this recipe all the time! 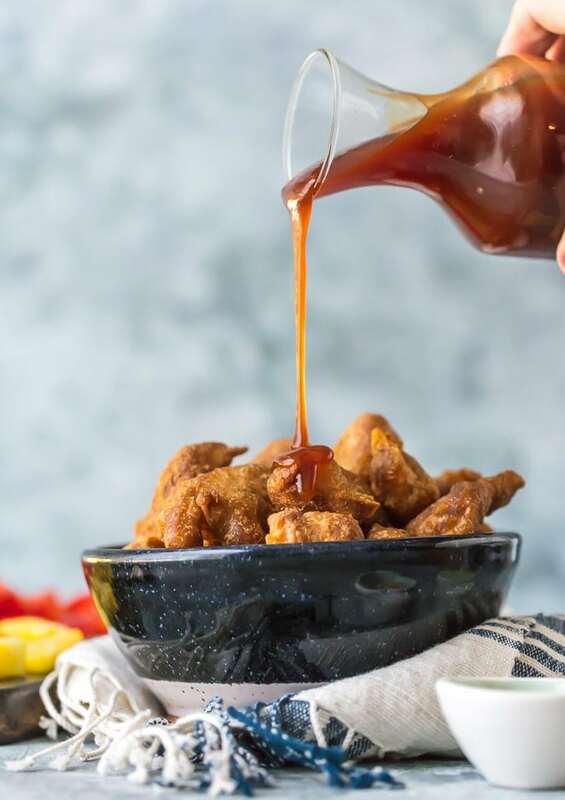 I love this easy sweet and sour sauce recipe to pour over my homemade sweet and sour chicken. How long will homemade sweet and sour sauce keep in the fridge? This sweet and sour sauce recipe should be stored in an airtight container in the refrigerator for up to 2 weeks. If you are storing the sauce straight after cooking, let it cool to room temperature first. 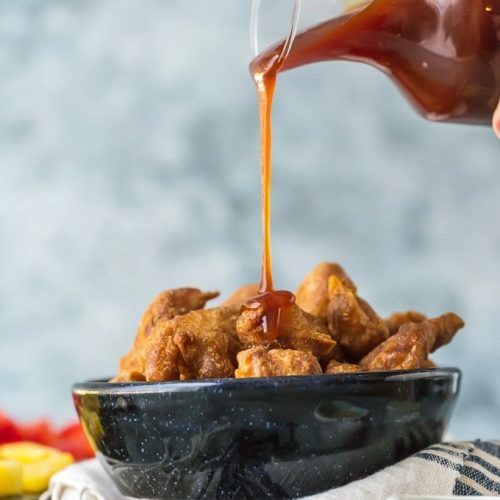 Make this homemade Sweet and Sour Sauce recipe for sweet and sour chicken, sweet and sour pork, or just as a tasty sauce for your rice and vegetables. It’s easy to make and so delicious! The flavor mixes perfectly with fresh pineapple chunks, bell peppers, and chicken. You’re going to LOVE this recipe. See the recipe card below for details on how to make Sweet and Sour Sauce. Enjoy! This Sweet and Sour Sauce recipe goes along with one of my favorite Chinese-American dishes: sweet and sour chicken! This homemade sweet and sour sauce is so tangy and tasty. I love slathering this sauce all over chicken, pork, or rice and vegetables. You can't go wrong! Mix together pineapple juice, water, vinegar, sugar, ketchup, pepper flakes, salt and soy sauce in a medium saucepan. Set the pan over medium-high heat and bring to a boil. Set heat to low and simmer until the sauce reduces to 1¼ cups, approximately 6-8 minutes. Stir together cornstarch and water, whisk it into the sauce and cook 1 minute or until the sauce has thickened. Transfer sauce to a heatproof dish. If not using immediately, allow the sauce to cool to room temperature and then refrigerate, in an airtight container, until ready to use. Sweet and Sour Sauce will keep up to two weeks.